Secluded on 5 wooded acres, luxurious feel inside, Log Cabin. The master bedroom is on the first floor with plush King bed, 2nd bedroom upstairs with plush Queen Bed and bath. Decks surround 2 sides of the cabin so that the outdoors can be easily enjoyed, you can even hear the small babbling creek behind the cabin. If you are lucky you will see some wildlife as well. Secluded in the mountains, yet minutes to shopping, restaurants, breweries, hiking and downtown Hendersonville which is only 5 miles away and grocery store is less than 3 miles. 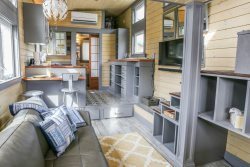 This cabin will comfortably accommodate 4 to 6 guests. There is a queen size sleeper sofa in living area. The kitchen is fully equipped with stainless steel appliances including a refrigerator, stove, microwave and dishwasher. Both bedrooms and living room have flat screen TVs. The open concept living area boasts a cathedral ceiling, wood throughout, a breakfast bar to enjoy your meals together. Relax and forget your troubles at this luxury mountain home. Great time to dIsconnect, the house is deep in the woods and WIFI may be spotty. *The OWNERS have recently (12/15/17) installed 4 security cameras on the OUTSIDE of the property, at each entrance and driveway. NOTE: Because it is deep in the woods, the WIFI may be spotty. *Please request us to turn the temp. up on tub if you are using that evening. It needs to be on STD Mode to heat up to 104. Easy to use. Fire Pit in private backyard by the brook, plenty of kindling, bring your own wood. Fully Equipped Kitchen and eat in Kitchen bar. Fire pit in private backyard near hot tub. NOTE: *The OWNERS have recently (12/15/17) installed 4 security cameras on the OUTSIDE of the property, at each entrance and driveway. Great place! It was very clean, modern, and well cared for. The driveway was a little scary for this beach girl, but I didn't go up and down it too many times. Booking was easy and the cabin was gorgeous! We visited the Antique Barn in Asheville window shopped and bought lots of Christmas presents in downtown Hendersonville. We really enjoyed waking up early and seeing the deer down by the creek. The vacation home exceeded our expectations. Our 1st time staying in the mountains. *Note: The Owners have recently installed(12/15/17) 4 security cameras OUTSIDE of their Whispering Trees Cabin (12/15/17) at each entrance and the driveway for your safety. Thank you for the wonderful cabin! Your house is cozy and comfortable with all the necessities! We'd love to stay again!. We had a wonderful stay! The cabin is beautiful. The weather didn't corporate, it was too warm. We are headed to Biltmore House to end our stay, thanks for sharing your home! Happy New Year! Thank you for allowing us to spend time in your cabin. We had a wonderful time in your beautiful cabin. We look forward to coming back in the near future. Thank you for sharing your cabin with us. We thoroughly enjoyed it. You have thought of everything! We really enjoyed the hot tub and the fire pit. We had fun visiting Sierra Nevada Brewing too! Your cabin is lovely and it made us wish we could have stayed longer. Hopefully we can plan for a longer stay in the future! Thank you so much for sharing your beautiful cabin with us and allowing for a special 29th wedding anniversary get away. God Bless you! Thank you so much for opening up your home to us. It was so cozy and inviting. We came for our honeymoon trip and we couldn't have picked a better place. We hope to return for an anniversary in the future. This was truly a magical experience! We thank you! We came up for a long weekend getaway and your cabin was exactly the retreat we were looking for. The care you've put into making sure your guests have absolutely everything they need is very obvious and much appreciated. We made use of the hot tub, fire pit and grill. This was a fantastic weekend for us! Thank you so much!